Vinyl Digital Exclusive: Official Edition with 140 Gram Double LP Repress - housed in thick Gatefold Cover! Sometimes, dreams come true! 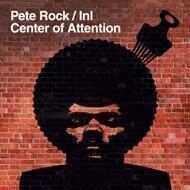 Vinyl Digital is very proud to present you the next exclusive vinyl release: Pete Rock, InI - Center of Attention! "Center of Attention" is without a doubt one of the best and most acclaimed hip-hop records of the 90’s, despite it never got an official release at the time. It perfectly combines Pete Rock’s outstanding production skills with the conscious and thought-provoking lyrics of InI, resulting in a monumental classic of hip hop music. After a long time, we finally present you an official high quality press of the legendary album on classy black vinyl with an exclusive gatefold cover - Check it out!